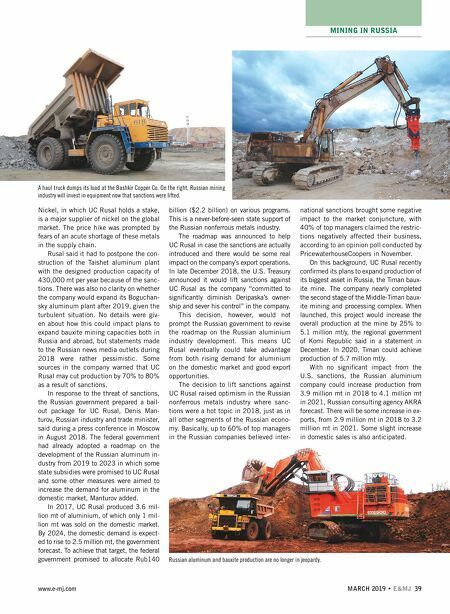 MINING IN RUSSIA 38 E&MJ • MARCH 2019 www.e-mj.com In the coming few years, Russian mining giants are likely to increase the produc- tion of nonferrous metals, including alu - minum, zinc, copper and possibly nickel. They will take advantage of the bright ex- port opportunities, national state aid pro- grams and absence of biting sanctions. Including all investment projects currently implemented, Russian miners could increase aluminum production from 3.72 million metric tons (mt) in 2017 to 4.13 million mt in 2021, cop- per production from 856,000 mt in 2017 to 864,000 mt in 2021, zinc production from 258,000 mt in 2017 to 301,000 mt in 2021, as forecast by Russian con- sulting agency AKRA. In the nickel in- dustry, a slight fall in production will be expected from 227,000 mt in 2017 to 217,000 mt in 2021, AKRA said. Aside from zinc, Russian miners pro- duce almost all nonferrous metals for the overseas markets, according to AKRA. For this reason, the recent tensions around the Russian aluminum giant UC Rusal, with the back-and-forth from the U.S. Treasury on the introduction of financial sanctions against the company, made the investment climate in the Russian mining industry in 2018 very unhealthy. For example, Vladimir Potanin, owner of Norilsk Nickel, speaking to a state- owned media channel Russia24 admit- ted that although his company had not been directly subjected to the U.S. sanc- tions, it still felt them like "a headwind" for business development. So far, other Russian mining tycoons remained silent about the possible threat of sanctions or how they could impact their companies. During 2018, U.S. President Donald Trump's administration sanctioned several Russia oligarchs with close ties to Russian President Vladimir Putin, who were de- scribed as being in Putin's "inner circle." So far, only Oleg Deripaska, owner of UC Rusal, and Viktor Vekselberg, owner of Ren- ova Group, were among businessmen in the mining industry affected by these sanc- tions. It is clear though, very few tycoons in Russia could be really insured from being included in the sanctions list, given the ris- ing tensions between Russia and the U.S. Prior to 2018, the U.S. government introduced sanctions primarily against Russian government officials and top man- agers in the Russian state-owned corpora- tion. The attack on UC Rusal and Renova Group resulted in investment activity in the Russian mining industry in 2018 that was unprecedentedly weak, as compared to the previous years. Everybody looked forward to the end of this story. UC Rusal's Thriller In April 2018, the U.S. Treasury imposed sanctions on Deripaska and all compa- nies in which he owned a stake, including UC Rusal and En+, prompting turmoil in the global nonferrous metals markets. It also raised concerns among investors that similar restrictions could be introduced later against other Russian companies. A few days after the U.S. Treasury announced plans to subject UC Rusal to the financial restrictions, the global pric- es for aluminum jumped nearly 25% to a seven-year high, and the global prices for nickel added several percentage points, reaching the highest level since February 2015. 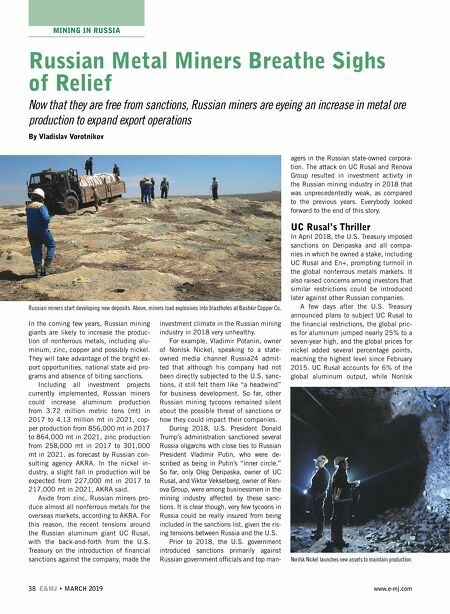 UC Rusal accounts for 6% of the global aluminum output, while Norilsk Russian Metal Miners Breathe Sighs of Relief Now that they are free from sanctions, Russian miners are eyeing an increase in metal ore production to expand export operations By Vladislav Vorotnikov Russian miners start developing new deposits. Above, miners load explosives into blastholes at Bashkir Copper Co. Norilsk Nickel launches new assets to maintain production.